Due to storms lining up to our west on Saturday, I delayed the range killing spray until Sunday morning. Cut off the dead material in a couple of weeks, grow it and spray again. 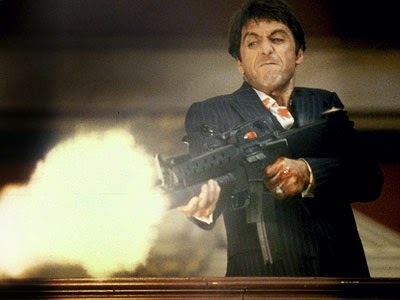 There Will Be Some Killing Going On at Glen Echo Today! I don't like to utter those words at a golf course, its all about keeping things alive most of the time. Say hello to my little friend Roundup and Fusilade Long Range Tee Bermuda grass. I will be spraying out the long range tee this morning in the beginning stages of changing the grass back to Zoysia. Proper divot patterns are not necessary this morning as you get ready for the Clarkson. Chop, chop all you like. Please refrain from walking on the grass area after this morning to prevent transferring of chemicals to finer turf areas. We appreciate your cooperation. 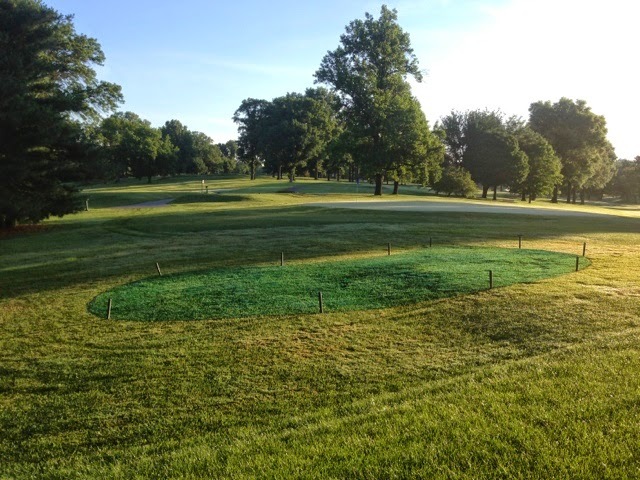 I sent out an email blast to the membership earlier in the afternoon giving notice of our plans regarding the turf replacement for the long range tee. The following information is some additional detail regarding changing this playing surface from Bermuda back to Zoysia which is the main fwy/tee surface. There might be a couple of questions you might have regarding this project. Why start this now? A couple of reasons. The Bermuda was damaged coming out of winter and is slow in responding. Also, we need enough time to kill a majority of the Bermud and give the Zoysia a chance to root and grow before dormancy sets in. Why not change ends of the range to the top. A number of reasons I explained to my committee. Cost would be much higher. A dozer would be needed to move dirt and build targets. Hitting balls down hill will increasing ball flight leading to more cost for balls and endangering my staff in our maintenance area. I'm sure we would be required to put up a very large fence to protect the metro link trains from being hit. Logistics of cart travel and walkers would be much more difficult and almost impossible. Shall I list more? As mentioned in the earlier email, our operating budget does not have the money to fund this project. 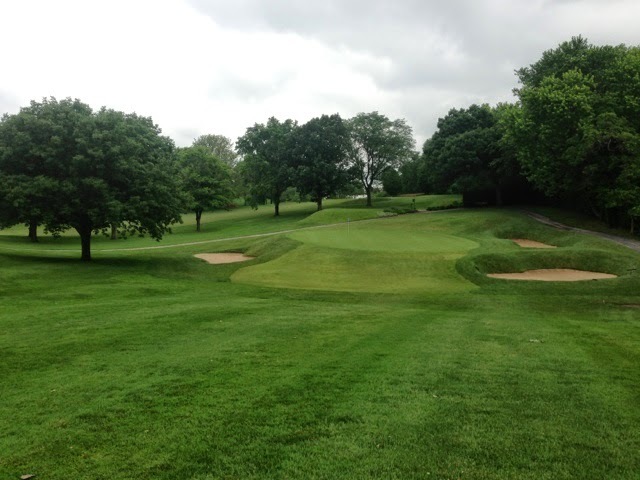 I had also stated the project would not be worth our time if we did not remove trees to improve turf conditions. My apologies in forgetting the estimated cost of $ 15,000 in the email. Our staff will do all the work except laser-leveling the tee and some of the larger scale tree work will require some assistance. No additional labor cost will be required. Like anything else we do extra on the course, we will schedule our regular work and plan our extra work accordingly. The long range mats will be open as much as possible during the process. The short range grass tee will remain open until dormancy so you have a place to warm up. During the construction, I encourage everyone to stay off of the treated turf. You could track chemicals back onto good turf surfaces such as the practice green from remnants of chemicals used to kill the Bermuda. We have 9 trees to remove on the east side of the tee. One will die from a lightning strike that occurred a month ago and the other is a hazard tree we will be removing. The trees shade parts of the teeing ground as late at 10 a.m. each morning. We plan to keep the shorter scrub material along the creek to provide some separation between the first hole and the range tee but as trees continue to grow, they will be removed as they begin to create shade on the tee. We will remove some trees along the creek bank on the west side of the tee as well. These trees shade the tee from 3 p.m. on and reduces the total amount of sunlight to the turf. We need a minimum of 8 hours of sun or more to have turf that can repair itself quickly enough as we rotate stations through the tee. Additional sun equals a turf that dries quicker and can become playable that much sooner than the past wet, soggy turf that we have experienced on this tee. A drier tee surface also reduces damage from divots during practice time. The work on the tee should get us almost two additional hitting stalls and we should have at least one more days's rotation from the very front of the tee. The following is a general work plan for the project. Till and Laser-level tee. Contractor. Install big roll zoysia. GECC staff. 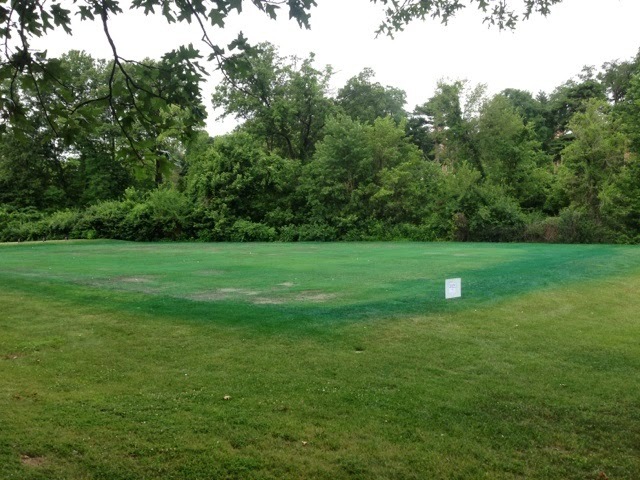 · The tee will not be ready for play until mid-May to the 1st of June 2015 depending upon completion date and grow in weather. As always, I will keep you informed of the activities as they happen. Just a reminder that Glen Echo is being recognized at 10:30 this morning in a ceremony on the Marvin Pierson Plaza by The St. Louis Sports Hall of Fame. Take a trip by the club to represent Glen Echo and see the ceremony. The next time you play hole 1, you might not notice the new fence as much. Skip and Russ painted 1/2 of it green today. We have to order in additional paint and will finish it next week. 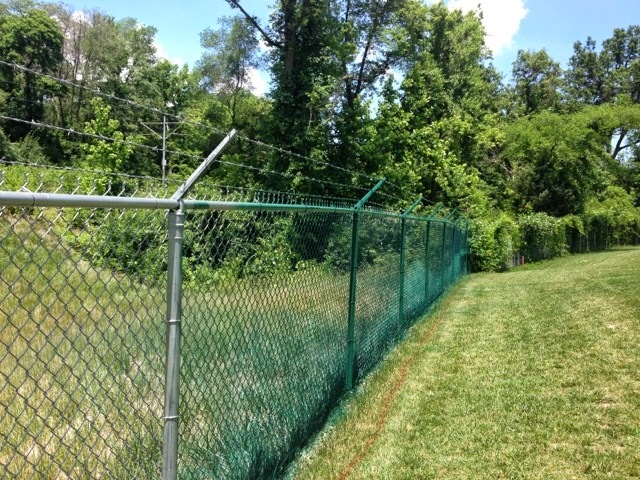 We intend to place some vining type plants on the track side of the fence to soften it further before fall. We will be installing a new bed on the left side of 13 blue tee to provide some buffer between the tee and 15 green. It is not intended to be a wall but will help in breaking up the open space. It will be slightly raised and will be of the more permanent plant variety, shrubs, grasses and a smaller tree.. A little mulch each season and some minor pruning is all that will be needed for this bed. Becky sprayed out the area with Roundup and some selective grass and weed killer. Some dye was used to help identify the area. Dye to outline the kidney bean shaped bed. Exchange gas. Good oxygen getting into soil with excess CO2 Carbon dioxide which can build up in soil. Improve water penetration in dry areas of the greens and dry out wet areas of the greens. Should improve rooting or at least stabilize rooting until additional heat sets in during July. Needle tining should create little if any effect on ball roll. Of course if we would not do this, we could have dead greens which could initially improve ball roll and then negatively effect ball roll and yours truly's job security. Happy Father's Day to all the dads out there. After leaving from work this morning and a quick trip to mom's, my afternoon will probably be spent on the couch watching the US Open mixed with some World Cup and a nap or two. Four more days of 3:45 wake ups with the Left Handed Golf Association Tournament this week. Have a great Father's Day!! Will get everything for most part mowed today except fairways and intermediate. Mowed greens last night and will double roll this morning. Friday evenings activities are open to all members. Dinner will be outside with a great menu planned, Drinks included. Spouses and significant others of players are included in the tournament package. Non participating members, the all inclusive charge is $75.00 per person. If you are a non playing member and would like to attend, please contact the staff and make a reservation. .
Also, with the change in the Saturday night program, the staff are trying to determine the number if people staying for the Ala Carte dinner planned that evening. Please let the staff know at sign -in today. The Awards Ceremony is being planned for an hour after the completion of the shoot out. Appetizers and cocktails will be available before the ceremony. Also, Thursday's practice round shoot out will be out on the course this year at holes 9, 3 where food station will be set up, 12, 13,14. Beverage carts will be out in force. Course is still wet. Especially fairways. Hope to mow this evening or by Friday morning if wet weather stays away. Have a great 3 days! A little sampling of what has taken place on the course over the last 12 months in the lead up to this event. Over 20,000 hrs of labor have been used to maintain the property. Over 9,000 acres of grass has been mowed. All surfaces have been aerated with greens 6 times. At least 6,000,000 steps have been taken to walk mow greens. 90 yards of mulch spread. Over 8,000 gals of fuel with almost equal amounts of Diesel and Unleaded. Almost 200 tons of sand have been used on greens and tee surfaces. Over 4,000 plants grown in greenhouse. A dizzying number of circles have been made around trees keeping them trimmed. Over 3,500 holes have been made and moved on our greens changing hole locations during the year. The turf's growth has slowed a little with the lack of sunshine which is helping us. Luckily, I have not applied the light rough fertilization that I normally apply in June..
Trashing the turf with mud trails everywhere will not occur for the sake of mowing. No doubt we want the best conditions possible but not at the expense of large scale damage which we would then have to face for the rest of the season. You can be assured we will work in the dark overnight if the course has dried enough to allow for mowing. For an Interesting viewpoint, check out a two week diary of Pinehurst #2 course superintendent Kevin Robinson. Kevin, his staff and an army of volunteers are undertaking the massive task to provide maintenance on an unprecedented scale of double national professional golf championships. Nice mention about the course blog from the USGA and James Moore who has worked in the Green Section for many years.